CALGARY, Alberta (AP) — Flooding forced the western Canadian city of Calgary to order the evacuation of its entire downtown Friday, as the waters reached the 10th row of the city's hockey arena. Overflowing rivers washed out roads and bridges, soaked homes and turned streets into dirt-brown waterways around southern Alberta. Police say as many as four people might have died. 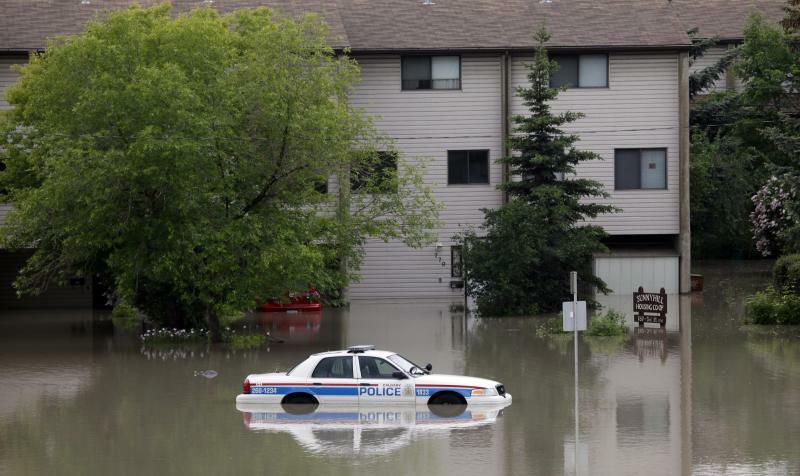 A spokesman for Canada's defense minister said 1,300 Army soldiers from Edmonton were being deployed to the flood zone. About 350,000 people work in downtown Calgary on a typical day. However, officials said very few people need to be moved out, since many heeded warnings and did not go to work Friday. 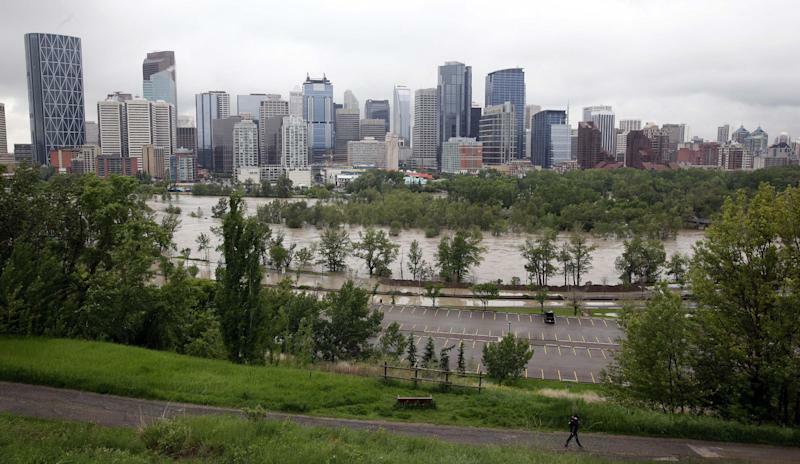 Twenty-five neighborhoods in the city, with an estimated population of 75,000, have already been evacuated due to floodwaters in Calgary, a city of more than a million people that hosted the 1988 Winter Olympics and serves as the center of Canada's oil industry. Outside the city, the Royal Canadian Mounted Police said two men were seen floating lifeless in the Highwood River near the hard-hit community of High River on Thursday, but no bodies have been found. They also say a woman who was swept away with her camper has not been located. And it wasn't clear whether a man who was seen falling out of a canoe in the High River area was able to climb back in. In downtown Calgary, water was inundating homes and businesses in the shadow of skyscrapers. Water has swamped cars and train tracks. The city said the home rink of the National Hockey League's Calgary Flames flooded and the water inside was 10 rows deep. "I think that really paints a very clear picture of what kinds of volumes of water we are dealing with," said Trevor Daroux, the city's deputy police chief. At the grounds for the world-famous Calgary Stampede fair, water reached up to the roofs of the chuck wagon barns. The popular rodeo and festival is the city's signature event. Mayor Naheed Nenshi said it will occur no matter what. About 1,500 have gone to emergency shelters while the rest have found shelter with family or friends, Nenshi said. Nenshi said he's never seen the rivers reach so high or flow so fast, but said the flooding situation was as under control as it could be. Nenshi said the Elbow River, one of two rivers that flow through the southern Alberta city, has peaked. The mayor suggested that levels on the Bow River — which, in Nenshi's words, looked like an ocean — would remain steady for the rest of the day as long as conditions didn't change. Police urged people to stay away from downtown and not go to work. The flood was forcing emergency plans at the Calgary Zoo, which is situated on an island near where the Elbow and Bow rivers meet. Lions and tigers were being prepared for transfer, if necessary, to prisoner holding cells at the courthouse. Schools and court trials were cancelled Friday and residents urged to avoid downtown. Transit service in the core was shut down. Residents were left to wander and wade through streets waist-deep in water. "In all the years I've been down here, I've never seen the water this high," resident John Doherty said. "I've got two antique pianos in the garage that I was going to rebuild and they're probably under water," he said. "We're shell-shocked." Alberta Premier Alison Redford promised the province would help flood victims put their lives back together and provide financial aid to communities that need to rebuild. The premier said at a briefing that she had spoken to Prime Minister Stephen Harper, who travelled to Calgary and promised disaster relief. Harper met with the premier and mayor. Redford urged people to heed evacuation orders, so authorities could do their jobs. She called the flooding that has hit most of southern Alberta an "absolutely tragic situation." 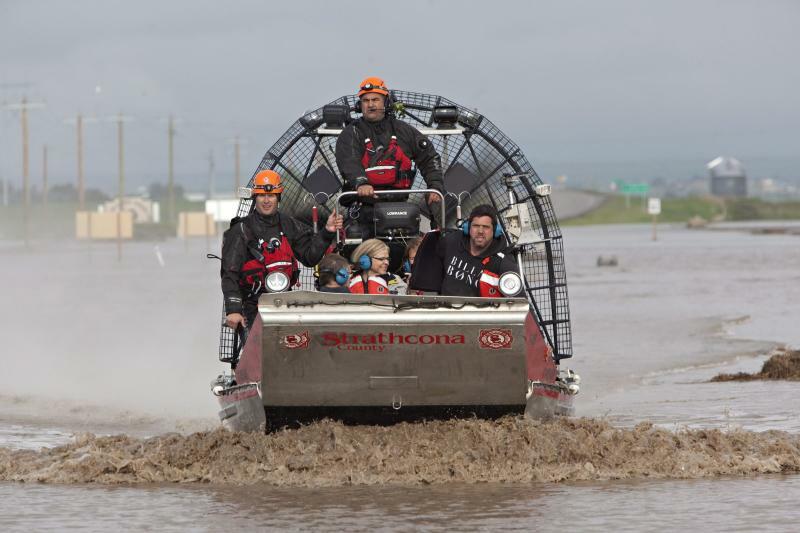 The premier warned that communities downstream of Calgary had not yet felt the full force of the floodwaters. It had been a rainy week throughout much of Alberta, but on Thursday the Bow River Basin was battered with up to four inches (100 millimeters) of rain. Environment Canada's forecast called for more rain in the area, but in much smaller amounts. Calgary was not alone in its weather-related woes. Flashpoints of chaos spread from towns in the Rockies south to Lethbridge. More than a dozen towns declared states of emergency. Entire communities, including High River and Bragg Creek, near Calgary, were under mandatory evacuation orders. Some of the worst flooding hit High River, where an estimated half of the town's residents experienced flooding in their homes. Military helicopters plucked about 30 people off rooftops in the area. Others were rescued by boat or in buckets of heavy machinery. Some even swam for their lives from stranded cars. Further west, in the shadow of the Rocky Mountains, photos from the mountain town of Canmore depicted a raging river ripping at house foundations. Associated Press writer Rob Gillies contributed from Toronto.